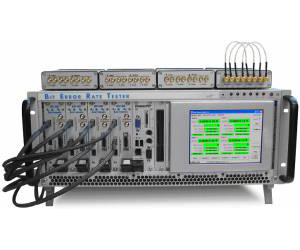 The BERT-400 series Bit Error Rate Testers handle a maximum bit rate of 400 Mbps per serial channel or 50 MB/sec per parallel channel. The BERT chassis above can be configured with up to 7 channels. More channels can be added using additional expansion chassis. Application software and User Interfaces are provided to control from 1 to 16-channel configurations. User input is by touch screen. The BERT-400 has a High-Speed Interface. The High-Speed Interface is available in several configurations with different electrical levels and connectors.